Yesterday, I got a ‘memo‘ text message from the Head Coach of the running clinic that I work at as one of the Sports Science Coaches; we were told reminded to be ready with our workout plan so as not to waste time plotting the program just a few minutes before the session starts. It’s not because we come to the clinic having no idea about what to do, but because we are always asked to come up with new stuff every session. And yesterday, going through the second month of the season, we are encouraged to keep it up and make it more thrilling. There seems like a limit to how many times a specific exercise can be re-used, which makes the workouts fun and exciting because the runners won’t know what exercises are laid out for each session. This is good for us as coaches because it challenges us to come up with creative yet equally demanding and effective exercises for the runners. We realize, learn, and experience new things in the process. It’s also fulfilling to see the many things that the human body can do, and how people can rise up to each challenge! We painstakingly sift through ‘stock knowledge‘ for exercises – that is, if there’s still something left from the sessions that passed- pushing our brain cells to squeeze out creative juices in order to create relevant and effective exercises of functional movement using just bodyweight or some crude equipments (ropes, tires, balls). Yes, we sometimes test ourselves if the exercises we come up with are safe and doable, or at least won’t be categorized as ’em>torture and have someone from the human rights department visit us. The sequence of those 5 to 6 exercises also matters – we won’t put the same target muscle groups back-to-back with each other. We make sure that the agonists, antagonists, synergists, and fixator muscles get worked out. We want to train the big muscle groups relevant to the movement of the sport, and the smallest ones involved in the most minute details from the extensor pollicis brevis to the stapedius muscle. After the excruciating process of researching, studying, experimenting, and sequencing the exercises, we can finally come up with the workout of the day. 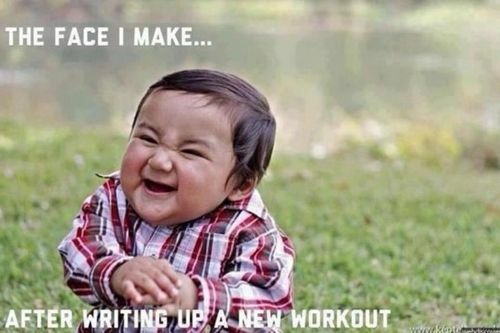 And as I always say after each bone-twisting and spine-tingling workout, always end it with a smile. You want a more challenging exercise? I’ll give you one.